What's the secret to the enduring appeal of Giant Slice Pizza? By Katrina Mae Leuzinger of Outer Banks This Week. There’s a lot that’s new at Giant Slice Pizza. Over the winter they put in new floors and added new paint and new decorations. They had to get a new map for the wall too because so many people had placed a pin where they’re from that they ran out of space on the old map. Two years ago, they got new owners, Adam Collins and Ella Cherepok. But it’s what’s decidedly not new that keeps locals and visitors coming back year after year. “When our family took over, we didn’t change a thing. What’s here has been working for more than 20 years,” says Ella. So what is it that’s made this little pizza place a traditional stop for visiting families for decades? Maybe it’s the top-secret formula for their delectable pizza sauce, a closely guarded recipe that’s been passed down as the restaurant changed hands. Or perhaps it’s because that sauce is used on pizzas that are intensely and fabulously cheesy. They do not skimp on toppings, and the smell of garlic and baking bread envelopes you the moment you walk in the door. The pizzas are baked in cast-iron deck ovens, a process that’s more art than science, where each pizza requires individual attention and finesse, and no two turn out alike. Even New Yorkers, naturally wary of a pizza joint in North Carolina owned by a family from Ohio, rave about their New York-style pizza. Perhaps it’s because their portion sizes are outrageous considering their very reasonable prices. They’re not kidding around when they say “giant” slice, and if you think the pizzas are huge, try giving their calzones or a “small” stromboli a try. They’ve got the market cornered no matter the size of your party. If you just want a quick lunch for yourself, you can order pizza by the slice. 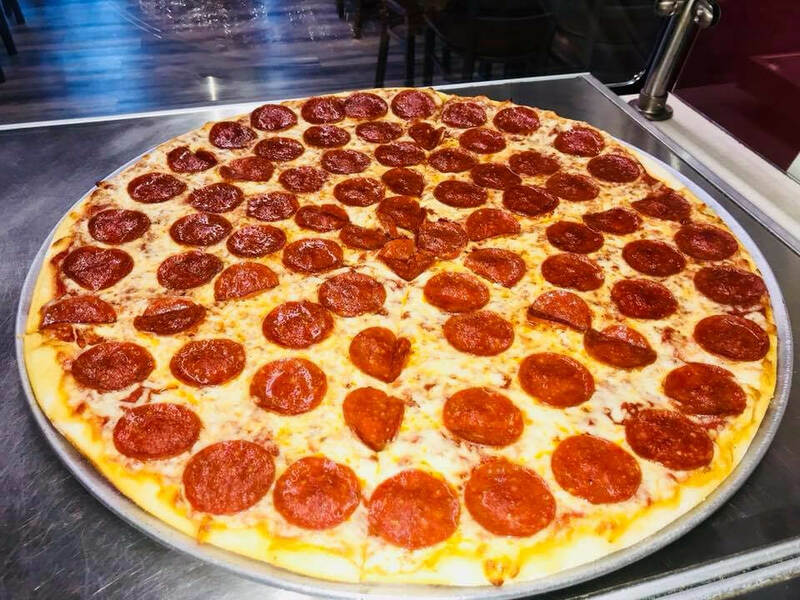 Toppings are placed on a single slice to order, so you can get exactly what you want. If you’re sharing a rental home with 20 of your closest friends, you can skip cooking or going out and order some pizzas and a couple family-sized salads for delivery. They’ll even deliver beer. And their drivers are out there no matter what sort of weather Corolla brews up. Personally, I think a small, but not to be underestimated, portion of their lasting appeal could be safely attributed to their cannolis, which are filled to just the right cream-to-shell ratio. And don’t forget about their wings. They’re oven-roasted to perfection with just the right amount of char. Or maybe it’s the friendly people behind the counter. Adam started out working there himself over the summer long before they bought the place. He’s in a couple of the old timey-style end of summer employee group photos adorning the walls, a tradition that’s been carried on for many years. Whatever it is, it’s clear that Giant Slice Pizza will remain a fixture in Corolla for years to come, and Adam and Ella are happy to carry on the tradition. So do yourself and your family a favor and check out Giant Slice Pizza for dine-in, carry-out or delivery. And be sure to order those extra cannolis.